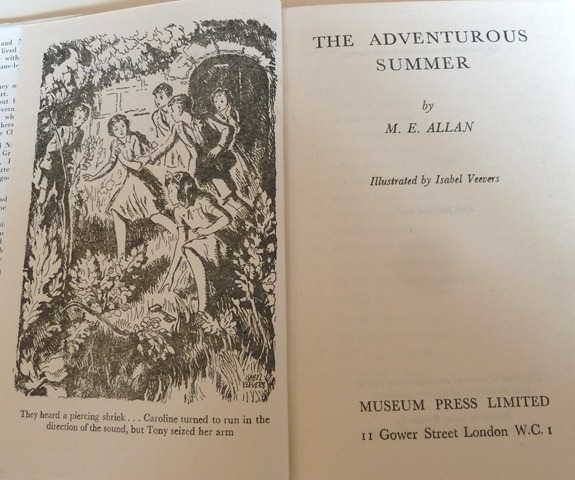 The Adventurous Summer was published by Museum Press in 1948, it was MEA’s second published book. 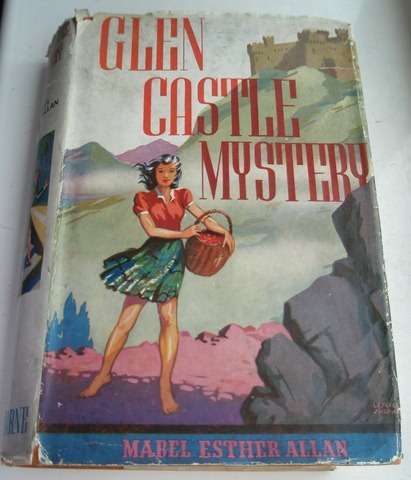 In To Be An Author, MEA says that it was written in 1945, after Warne had accepted Grim Glen Castle for publication, and accepted by The Museum Press in early September 1945, with a royalty agreement and a fifty pound advance. The original title was Sorrel at Wyndstane, but it was changed before publication. Sorrel and Nicholas Richmond leave their London home to stay with their aunt, uncle and cousin in the Cotswolds whilst their parents go to America with the orchestra in which their father is first violin. Their uncle works as bailiff to the Earl of Wyndstane, looking after the farms on the estate, and they live in an estate house. They don’t want to leave London, but make the best of things, and enjoy a visit to the theatre on their last night, to see a play starring Mary Marraine. On their arrival at Wyndstane by the Water station, they see a girl about their age saying goodbye to an older lady, clearly upset. 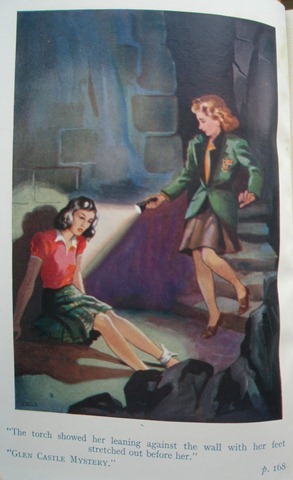 They find that she is the grand-daughter of the Earl of Wyndstane, and that she was seeing off her old governess, as the Earl thinks she needs a stricter one – Caroline’s one ambition is to go to school, but whilst her parents are abroad the Earl refuses to consider this, disapproving of schools for girls. Their cousin Joy is eight and very pretty, but has a will of her own. She would like to be friends with Caroline and the others, but they don’t take much notice of her, although she is useful for showing them round the neighbourhood. Sorrel and Nick make friends with Caroline and Tony, her friend who lives on one of the farms, meeting at a ruined Roman villa deep in a wood, with a mosaic floor covered by a shed. Caroline suggests that they form a club in order to have adventures, and that they find some more members. Eventually the club is expanded to include Shandy Mortimer, daughter of Mary Marraine, and a local boy, Bill Baker. Joy wants to join too, initially they think she is too young, but after she saves them from being caught by Caroline’s grandfather (who would not approve of her association with the others), they invite her to join too. Sorrel is invited to tea at Wyndstane Court, an Elizabethan manor house, to be company for Caroline, but they manage to get locked into Caroline’s secret hiding place, an unsuspected priest’s hole, much to the Earl’s annoyance. Sorrel and Nick are to attend the local high and grammar schools, much to Caroline’s, and Shandy also attends the High School. 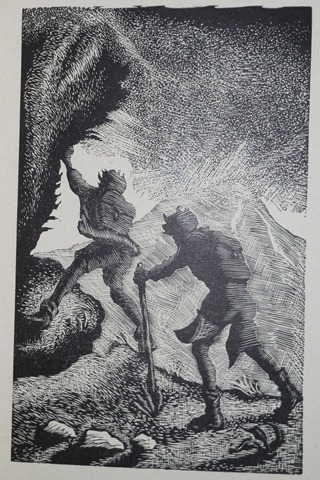 The Adventure Club meets on several occasions during the book, their adventures take the form of having an early morning May Day picnic to bathe in the dew, a moonlight picnic in a hayfield and an evening camp-fire on the burial mound (on that occasion they put out a fire in a haystack started by a tramp). They also meet regularly at Cloud Ridge Manor, a deserted house nearby, and store some provisions there, in the old buttery. Shandy’s one ambition in life is to be an actress like her mother, but she doesn’t dare tell her mother, who has sent her to stay with a friend (who Shandy calls Aunt Harriet) to have a healthy country upbringing away from town and theatres. Mary Marraine visits and takes the whole Club to Stratford, where they see a performance of A Midsummer Night’s Dream (Shandy is desperate to play Puck), but she still doesn’t manage to pluck up the courage to tell her mother. 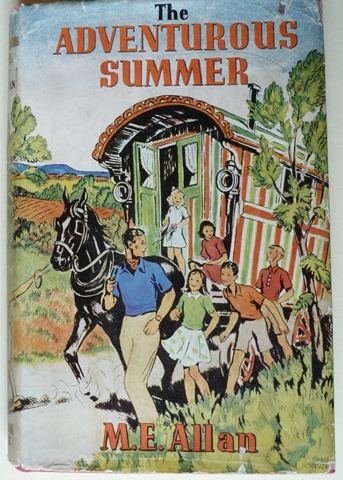 Later they meet up with Sorrel and Nick’s Uncle Hilary, who is travelling round the country in a horse drawn caravan, and writing a book about his travels. He also writes plays, and shows them his latest, which has been written for Mary Marraine, but they are having trouble finding a young actress who can play her character as a young girl. Shandy learns the part, and practices in the woods, and eventually, with Sorrel’s help, her mother sees her there and takes her back to London to take the part in the play. Uncle Hilary takes the remaining members of the club away for a few days in the caravan, all except Caroline, as her grandfather refuses to allow it. She decides to run away after them, but they have changed their mind about their route, and she doesn’t find them, so she decides to sleep at Cloud Ridge Manor. In the meantime her parents have returned, along with Sorrel and Nick’s, and a hunt is launched for her. Joy wakes to see flames coming from the old manor house, and guesses that Caroline is hiding there. They find her safe if a little dazed, her torch battery had died and she was using matches to find her way about, and accidently set fire to the old building, which is destroyed. It is decided that Sorrel, Caroline and Joy will all attend the new boarding house at the high school from the next term, and that Nick will live with his aunt and uncle and go to school with Tony every day. The book ends with the Club all going to the London theatre to see Shandy in her mother’s play. The book opens in London, where the Richmonds live in Cheyne Walk in Chelsea (also home to Nancy Mitford’s Linda). The rest of the book is set in the Cotswolds. 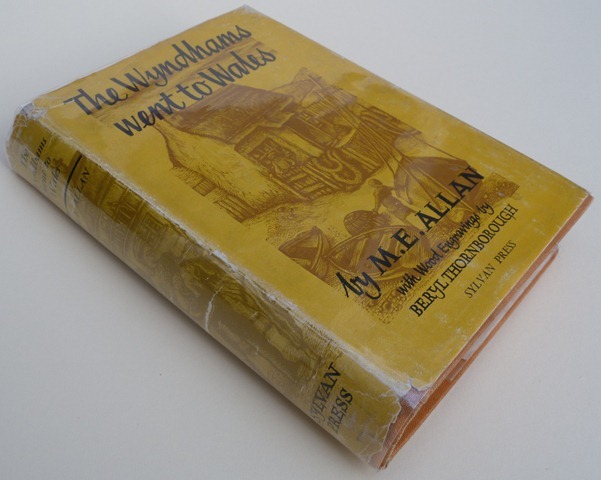 A friend had a cottage on the hillside above Winchcombe, which MEA stayed at in 1935 (The Background Came First), and became Wyndstane on the Water in the book. The local big house is Stanway House – was this the basis for Wyndstane Court? The Club also visit the local Neolithic barrow, “Look! There are low walls all around, and here’s where the entrance was, only it’s bricked up.” Presumably based on Belas Knap (click for more info and lots of photos) – the entrance seems to have been opened since MEA was writing. The Club visit Stratford with Shandy’s mother, and visit the theatre. On their trip with Uncle Hilary, the Club visit the abbey of Monks’ Cloud, which is probably Hailes Abbey. 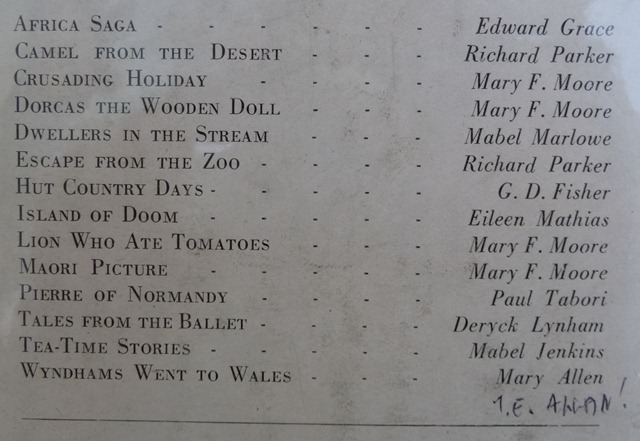 Caroline goes on holiday twice during the book, once to North Wales, and once to Cornwall, both locations MEA wrote about often, although we get no further details here. This is a very pleasant and enjoyable book. The plot is extremely predictable (especially the Mary Marraine and Uncle Hilary storylines), but it’s none the worse for that. MEA takes the absent parent theme somewhat to extremes in this book, with no less than three lots – Sorrel and Nick’s are in America with her father’s orchestra (shades of Elsie Oxenham! ), Caroline’s are in Peru with her father’s company (MEA’s father also often visited Peru), and Shandy’s mother has left her with an old schoolfriend whilst she is acting in London. Her father isn’t mentioned. Somewhat unusually Sorrel at least misses her parents, unlike most children in books of the time, who seem to take separation as a matter of course. Caroline wants her parents to come home so she can go to school, but doesn’t seem to miss them otherwise. Sorrel keeps a diary throughout the book, but this doesn’t lead anywhere, plot-wise. The school Sorrel and Shandy attend is a standard High School, with the usual forms and prefect structure – no hints of progressiveness here. There are even boards with lists of the head girls going back to 1835, which seems a little excessive! 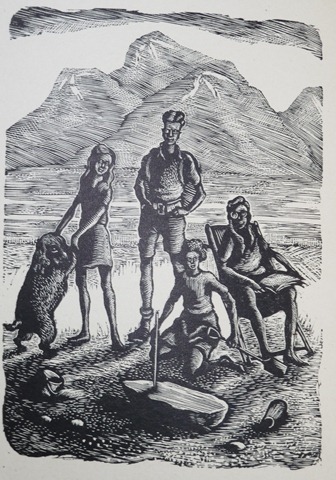 There are two adult writers in this book – Shandy’s Aunt Harriet, and Sorrel and Nick’s Uncle Hilary, who conveniently announce that they are to marry at the end of the book. Aunt Harriet prefers to write in an upstairs room, shades of MEA’s own study which was given to her when she was twelve, “there was an extra room looking out on the garage roof, and it was given to me to be my study.” (To Be An Author). There was a sequel to this book, but it was never published – in More About Being an Author, MEA says “….I wrote a long sequel….All trace of it, including the file envelope, has gone. But I think it was called The Mystery of Jermanda. Jermanda, who came to stay with them all in the Cotswolds, had a secret, but I no longer remember why it had to be a secret. She wanted to be, or was, a ballet dancer. Museum Press didn’t like the book, and being a straight sequel, it was unlikely to sell anywhere else. I hadn’t then learned the very important lesson….never write an unsolicited sequel. Get approval, or preferably a contract, first.” But a fragment does survive, in the form of a published short story, The Silver Rose, as mentioned in The Background Came First (see below). 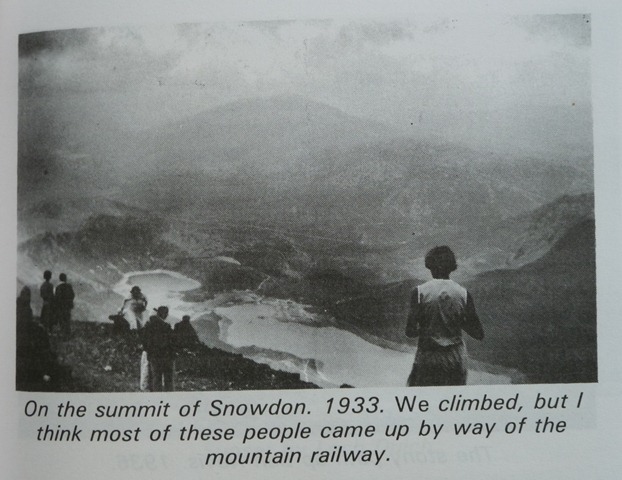 There are numerous mentions of farming throughout the book, as the Club help on the various farms on the estate – presumably MEA was drawing on her wartime experience in the Land Army. Shandy walks through the hills singing ‘Early One Morning’, which is the song Cicely rewrites for Miriam in EJO’s Girls of the Hamlet Club – Miriam is also fond of singing whilst walking through the hills. 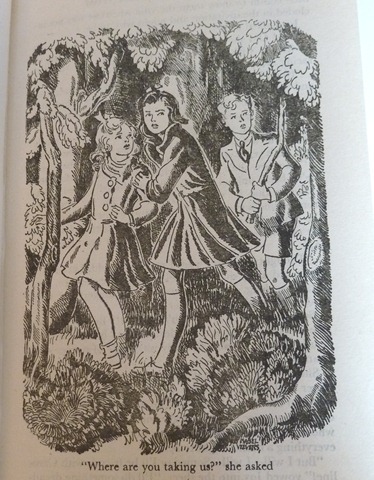 Twice in the book Caroline mentions that she wants to “be the naughtiest girl in the school…like that book I was reading.” Presumably MEA is thinking of Enid Blyton’s book, but one has to wonder whether she had actually read it, as Elizabeth very definitely doesn’t want to go to Whyteleafe, completely unlike Caroline! 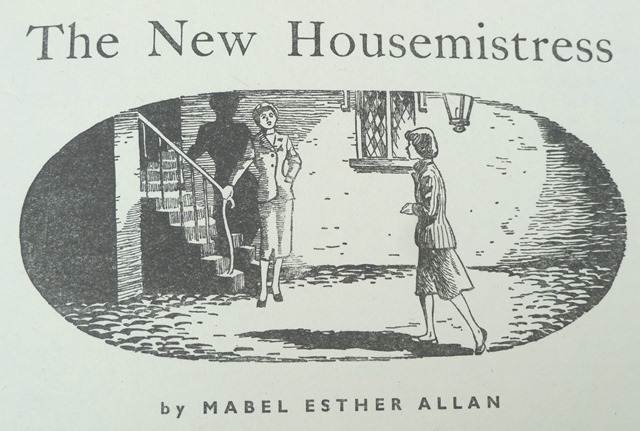 The location of The Adventurous Summer is the same as that of School on Cloud Ridge – the new school is built on the site of the old house which burns down at the end of the book – but none of the characters overlap, sadly, although there is a passing mention of the Earl being ill. 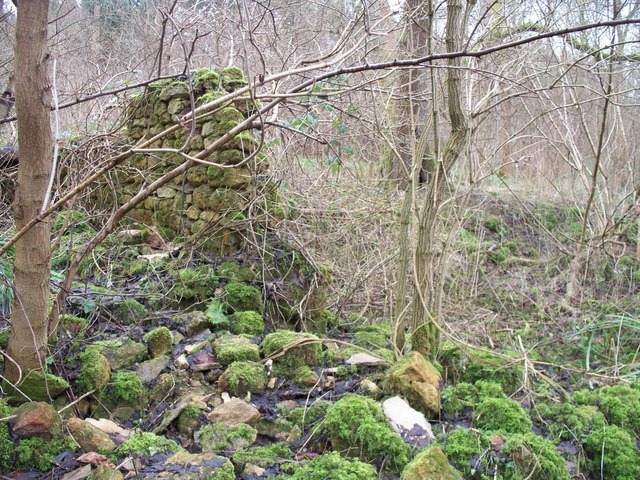 This story is also set in Wyndstane-on-the-Water – Wyndstane Manor School is described as being ten minutes’ walk from the station, past the gates to the Court – but there are no other connections. 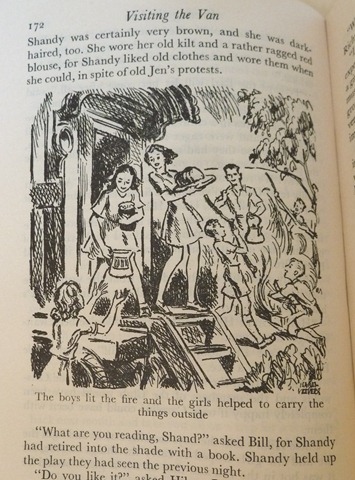 It was originally published in a Blackie Annual called For All Girls, then MEA republished it herself in her collection The Two Head Girls and other school stories. 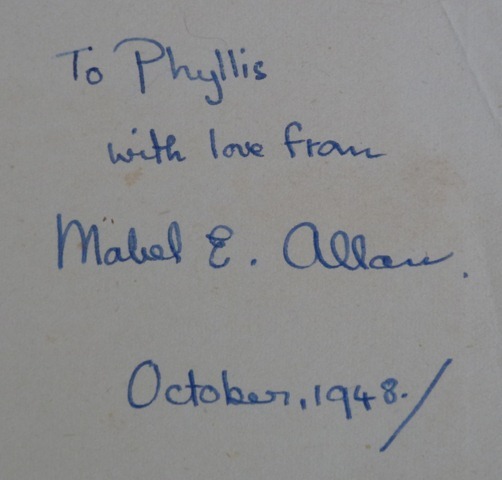 In her notes to the collection, she says, “This story was sold in 1951…. [it] is much more definitely Cotswold, being set in the semi-imaginary Wyndstane of my early book, The Adventurous Summer. It was really the country around Winchcombe, with its many wonderful old houses.” She goes on to say that the story was based on her own experience as a housemistress at Hampden, but that she moved in from Buckinghamshire to the Cotswolds, because it was quite recent.